For those paying attention, the name of Bernard Osher has for two decades been associated with multiple investments in academic integrative medicine. The first hint of what was to come was in 1998. These were the earliest days of academic integration. He and his spouse, Barbro Osher, established the Osher Center for Integrative Medicine at UC San Francisco. Since then, Osher has established five others through the Bernard Osher Foundation. Now comes news that their joint efforts will be empowered in perpetuity through a $5.5-million endowment of a “Coordinating Center” for the Osher Collaborative for Integrative Medicine. 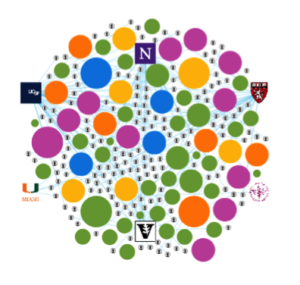 The network of centers slowly came into view as an emergent constellation, clustered in the United States with an outlier in Norway. The second to open was a flagship center at Harvard, then directed by David Eisenberg, MD and now fascia researcher Helene Langevin, MD. The Karolinska Institute – which brings us the Nobel prizes – added additional luster in 2005, broadening the Osher name’s linkage across the whole Euro-North American band of the “integrative” brand. Martin Ingvar, MD, PhD is the team leader there. One early development was a collaboration with JACM (Journal of Alternative and Complementary Medicine), a peer reviewed journal for which the present writer serves as editor-in-chair, that is dedicated to exploring “Paradigm, Practice and Policy Advancing Integrative Health.” In 2018, the Osher Collaborative will become a column partner of JACM with quarterly contributions relative to the issues in the expanding field. Comment: Adler’s excitement for the collaborative potential with the opportunity provided by the Osher endowment reminded me of the excitement I heard from Tracy Gaudet, MD in 1999. The Veterans Affairs leader in patient centered care and cultural transformation was then the director of what is now the University of Arizona Center for Integrative Medicine. The now 70-institution plus Academic Consortium for Integrative Medicine and Health, was at that time - in the phrase favored by my down-to-earth father - “nothing yet but a gleam in their eyes.” One interesting evolution ahead for the Osher Collaborative will its optimal relationship with that larger organization. The bigger question for the rest of us is the what’s in it for me? How will, as the release declares, this development be its own pebble in the pond to send out waves that support integrative medicine, as a field, internationally? In what ways will creating this “magnifying and maximizing” mortar and glue power up their “collective impact on health and well-being internationally”? The interview with Adler reminded me of a road thus far not taken by Bernard Osher, amidst all his generosity. He has not chosen to endow this academic constellation with the power of integrative inter-professionalism. When I directed the Academic Collaborative for Integrative Health from 2007-2015, with its distributive leadership among academics in acupuncture and Oriental medicine, naturopathic medicine, chiropractic, massage, nutrition, midwifery, yoga and more, I nurtured a fancy. I even drafted a never-delivered proposal. 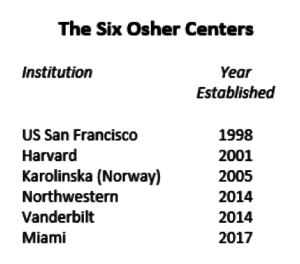 What if the Academic Collaborative for Integrative Health – with its long history of working with colleagues in conventional academic medicine – became what would now be the 7th Osher Center. The Osher Collaborative would get this core set of experienced voices and contributors, dedicated to collaboration, with one investment. What is the new era for “health and wellbeing” that the Osher Collaborative’s Coordinating Center will help foster if not one of respect for teams, for multiple voices, for the basic horizontal commitment in the “about, from, and with” that defines respectful interprofessionalism?